The George Christian House, built in 1919 by the firm of Hewitt and Brown, has been the home of the Hennepin County Historical Society since 1957. George H. Christian arrived in Minneapolis in 1866 and as manager for the Washburn-Crosby Company coordinated the perfection of a "New Process" of milling springwheat. This new technology revolutionized the industry and made Minneapolis the flour milling capital of the world from 1880 to 1930. Christian made so much money from the "New Process" that he retired in 1875 to pursue his interest in art, music, philosophy, and philanthropy. The Christian name continued to be associated with flour milling through his two brothers and son, George Chase, who remained active in the business. Mr. Christian began work on this house in 1917. He selected the architectural firm of Hewitt and Brown, each partner of which had married a niece of Christian. Edwin Hewitt's design is a mix of the Renaissance and late English Gothic. Its brick facade is broken by a two-story window bay with carvings and a balustrade that encircles the roof. The interior features African-cypress floors, carved fireplaces, and ironwork by well-known artist Samuel Yellin of Philadephia. Before the project was finished Christian, his wife, and his son died, leaving Carolyn (also spelled Caroline) McKnight Christian, the younger Christian's widow, seven servants,and four foster children as the only occupants for the next forty years. 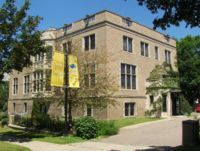 Among Mrs. Christian's many charitable acts were the endowment of a professorship in cancer research at the University of Minnesota in her husband's name, and the donation of her house and art objects to the Minneapolis Society of Fine Arts in 1957. The Hennepin County Historical Society purchased the house in 1957. The Washburn-Fair Oaks "Mansion" District is located in Minneapolis just south of downtown. Fair Oaks became a fashionable neighborhood for several generations of Minneapolitans because it was convenient to downtown yet separated by elevation from the working sections of the city. The neighborhood's grandest mansions were built by the first generation Minneapolis business leaders from the 1850s to the 1880s. Today the district consists of early 20th century homes of the second generation elite clustered around the Minneapolis Institute of Arts, Fair Oaks Park and the First Christian Church which were built on the sites of the earlier mansions. Most of the houses are now used for commercial and institutional purposes. A wide range of period revival styles were popular during this period, and most of them are represented in the district. The park is named for Senator William D. Washburn who built an impressive home (at the cost of over half a million dollars) on this 10 acre site, which he named for the oak grove on the land. He died in 1911 and the home was demolished in 1924 to make room for the park. The Christian Mansion is home to the Hennepin History Museum. The Hennepin History Museum is one of the Twin Cities' most unique social history museums. Offering superb exhibits, a historic mansion setting, and archival collections of priceless scholarly value. HHM has evolved from the Hennepin County Territorial Pioneers Association in 1858 to the County Historical Society in 1938 to an award-winning history museum embracing a diverse range of cultures and social histories. The exhibition and education programs have grown from a focus on original Hennepin County settlers to documenting the wide range of people who make up the county today. As one of Minnesota's most rapidly growing and diverse counties, Hennepin includes urban, suburban, and rural communities. All of these stories may be fuond in the exhibits, library, and outreach programs at the Hennepin History Museum. This page was last modified on February 29, 2016, at 16:01.